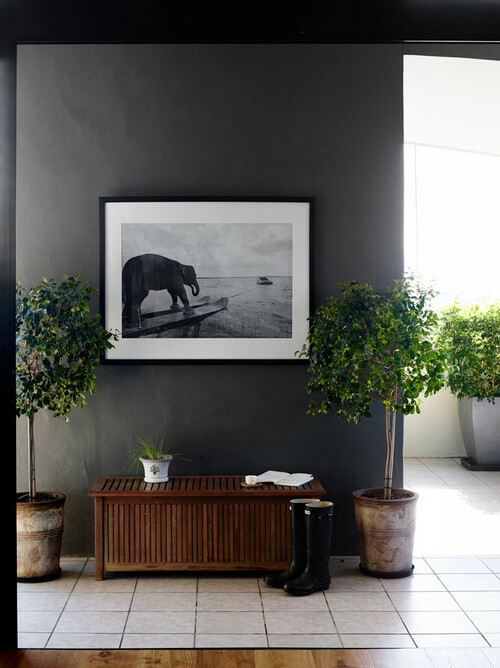 I love a richly hued wall but it's not always easy to select art that goes well with moodier tones. 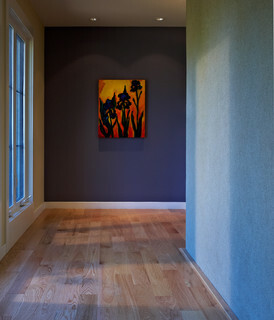 Dramatic tones invite mystery and selecting art can be tricky. I prefer to stay in the same tonal range so I often select works that are just as rich and moody as the walls. Black and whites photographs almost always work well against darker walls, especially if the wall is navy or slate gray. You can also choose art that offsets the wall -- brightly colored prints with fuchsia or lavender tones are a great way to add color and a touch of personality. Finally, I love prints with warm tones, particularly against a dark brown wall. Keeping the colors in the same family ensures your overall palette is soothing particularly if you keep to all warm tones or cool tones (think farmhouse or beach house) Finally, delicate florals photographed against a black background are a lovely, modern display for your walls. A black room can be modern and stylish. Not everyone can pull it off but if you have a black room, pair it with bright florals or minimalistic macro shots.